Upper Darby, PA – The Outlaws continue to be the team to beat this year. On Thursday night, they rolled over PAS Giannina adding their seventh victory and remaining unbeaten. From the outset, the Outlaws came in fresh and ready after the holiday break. There wasn’t a place left, on the court they couldn’t score from at will. PAS Giannina seemed flat and unable to slow the pace of the Outlaws. They’ve had a solid year and will be in the playoffs, but it’s going to be a fight to make it out of the first round. 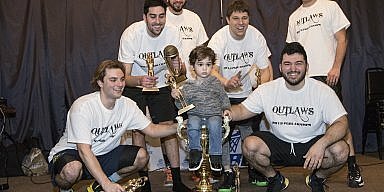 Final Score: Outlaws 88, PAS Giannina 45. Game three featured Tune Squad and the Revolution. In past years the Revolution had been a dangerous contender during the playoffs, but this year, they are struggling to bring home victories. Although they put up a good fight, the Tune Squad who appears to be one of the teams that will challenge for the championship this year, took home the win. 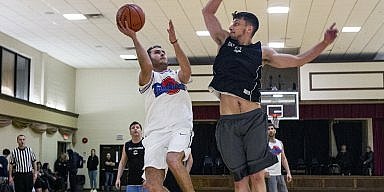 The Tune Squad scoring was led by Ben Voudouris’ 27 points and Dimitri Zanikos’ 24 points. Final Score: Tune Squad 64, Revolution 52.